A new generation of broadcasters are to join the world's airwaves after the launch of open-source software which allows people to run a radio station from a single computer for free. Campcaster takes a regular PC and turns it into a tool for managing every aspect of a radio station broadcast. The software is the idea of the non-profit Media Development Loan Fund, which aims to support independent news media in emerging democracies. Developer Douglas Arellanes told BBC World Service's Digital Planet programme that as well as playing files, which can be done from any media player, Campcaster adds features specifically for radio broadcasting and uses it for all aspects of a radio station, such as the ability to stored and schedule music, line up news clips and interviews, and preview listen to a record before it is played on air. "You can now pretty much run your radio station off a notebook computer," he said. Until relatively recently, running a radio station required a large amount of hardware, some of it rather complex - and most of it expensive. Mr Arellanes explained that the software had been developed specifically to tackle this. "The most important thing about Campcaster is that you don't have to be in the studio listening to the music - you can be sat at home and still operate your studio," he said. "If you want a good playout system, it's going to cost you more than $1,000 just for the licence - and that's only for one computer. "What we find is that when we go out to various radio stations in lots of different places in the world, that a lot of stations are using pirated software, and that's just wrong. "Even though we support open source, we're dead against using pirated software. So we said, 'well that's a very strong reason right there - cost and piracy'. "But there was another thing that we found, which is flexibility. With an open source system, you can actually add on new features as you see fit." One of these new features is to be the ability to integrate what is played out with a station's website, so that details of the actual track being played can be seen, as opposed to simply the title of the programme. 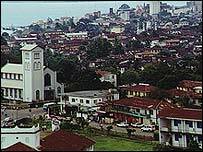 The most recent version of the software was rolled out in Sierra Leone, and is named after the country's capital Freetown. It is being used in both universities and small communities. Sahr Gborie, of development group Sierra E Riders, said he had found Campcaster to be "a very good piece of software for broadcasting". "We have installed it on several radio stations," he added. "They are finding it easier to present news and do their radio presentations."